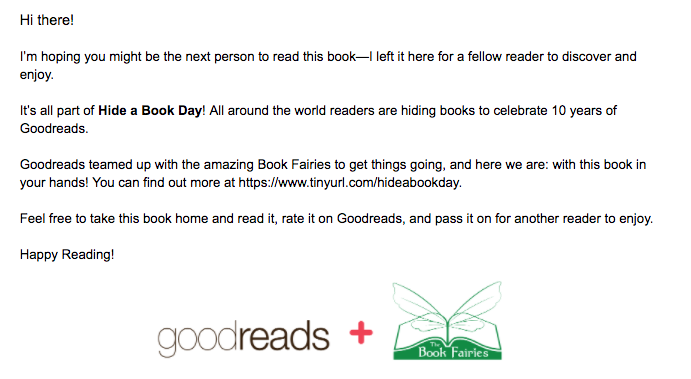 Tracy's Big Bookshelf : Goodreads Turns 10! I have been a member of the Goodreads website since 2014. It's had a very positive impact on my reading. I've always been an avid reader and Goodreads has added extra elements to my reading. It's put me in contact with authors and enabled me to ask them questions. I can share my own reviews and read others, get suggestions on new authors and books. and spend time in the vitural world with like-minded people. One of the things I enjoy the most is seting myself an annual target of a number of books to read. In 2014 I set a target of 12, I try to increase the number of books each year and this year I am ahead of schedule by 3 books so hope to break my target. I am also part of an audio book challenge group where collectively we hope to listen to 1000 audio books this year. So far I have listened to 7 of my personal target of 24. 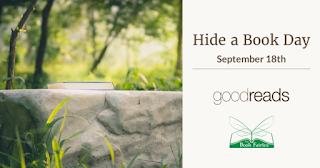 This month Goodreads turns 10, there are a few things happening on the website which you can find out about here. One of the fabulous quirky events taking place that anyone can join in with is Hide A Book Day which happens tomorrow 18th September. Just print the slip or write a note inside and pick a place to hide your book. "Keep the weather in mind for any outdoor locations (soggy books are sad books) and remember that the books should be hidden…but not too hidden (abandoned books are the saddest)." Here is the book I will be leaving for someone to discover. I will be back next week with a photo of where I decided to hide it! All photos courtesy of Goodreads website unless otherwise stated.